The Loft Mountain Loop is an easy, 2.7 mile trail that makes use of a fire road, the Appalachian Trail and the Frazier Discovery Trail. 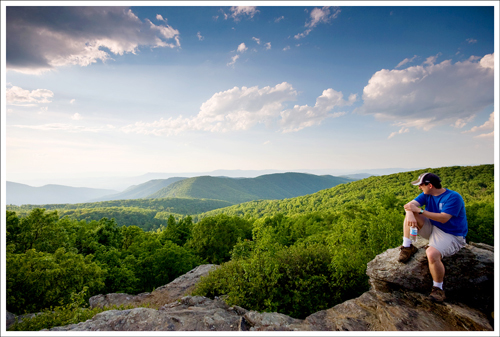 It takes you past one of Shenandoah National Park’s finest views. Adam and I love visiting the park on weeknights after we get off work. The traffic is usually light and the animals tend to be more active. On Tuesday night, we saw many deer, a timber rattlesnake, a couple rabbits, a bear with three cubs and only a handful of human beings. If you live close to the park, weekday evenings are the perfect time for a quick hiking escape – especially on June nights when twilight lingers until 9:00 p.m.
On this particular night, we chose to hike the Loft Mountain Loop, which is located in the south district of the park. Generally, fewer people visit the south end of the park than the other two districts (north and central), so it always feels quiet and peaceful. I have so many fond memories of camping at Loft Mountain as a child. We had a rickety, second-hand, pop-up camper. I remember waking up on cold mountain mornings to the smell of bacon cooking over the campfire and going to sleep at night after roasting marshmallows and listening to my dad’s goofy “ghost stories”. Ah… such nostalgia! 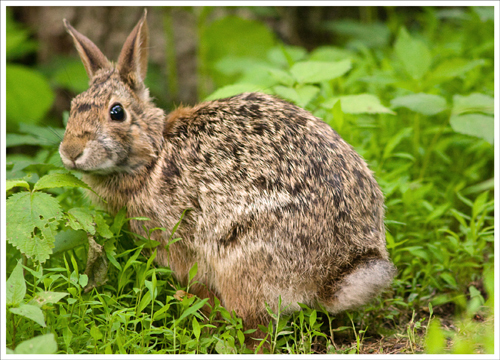 A friendly rabbit along the fire road. The hike starts out on a fire road almost directly across Skyline Drive from the Patterson Ridge Trail. 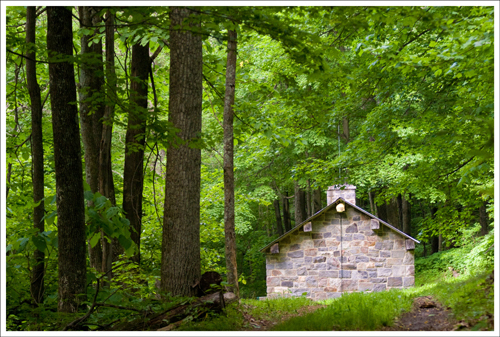 The hike goes uphill for a short distance until you reach the Ivy Creek Hut (used by the Potomac Appalachian Trail Club for maintenance activities) and the Ivy Creek Spring. Pass through the site and follow the blue blazes uphill for a couple hundred yards to the junction with the Appalachian Trail. The stretch along the AT climbs steadily uphill for about a mile. It eventually levels out on the ridge of Loft Mountain. At this point the terrain opens up – the trees are further apart and the trail is grassy and almost meadow-like. Adam kept getting ticks on him (FIVE! ), but I didn’t get any at all. The Ivy Creek Hut is used by the PATC. Your first nice view will come on a small rock outcropping facing northeast, but the big payoff for this hike comes at the 1.5 mile mark. The southwest facing summit of Loft Mountain is awesome – definitely one of the park’s most spectacular views. We reached the vantage point in time to see the building storm clouds to the west. We shared the summit with an Appalachian Trail thru-hiker camping nearby. He was from Boston and had been on the trail since March. He told us he had covered 22 miles that day and was looking forward to spending an upcoming night off the trail at the Big Meadows Lodge. He remarked that he was thinking hard about a big cheeseburger and a cold beer. I couldn’t help but think of the guy later on in the evening when we were back in our car, watching the Loft Mountain area being pummeled with lightning and torrential downpours. I love hearing trail stories from thru-hikers, but I don’t think long distance backpacking is for me. We stayed on the summit for about fifteen minutes, and then quickly made our way down the Frazier Discover Trail and back to our car. This is a trail that we both enjoy quite a bit. It’s not too tough and has some nice views to both the east and west, which is not common for Skyline Drive. If you do this hike early in the morning or late in the evening, you should be able to see a good view for a sunrise or sunset. There are also a couple of possible campsites along this stretch of trail and a developed campground along Skyline Drive at Loft Mountain. 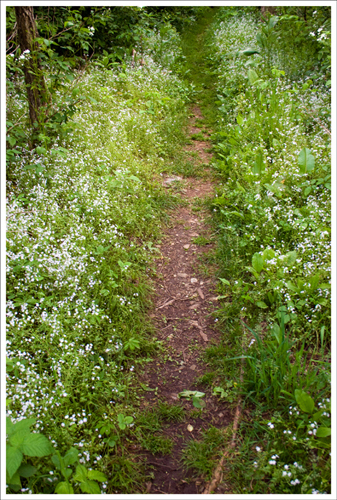 The trail was lined with little flowers. It was very interesting to talk to the AT hiker. June is the month when most of the northbound thru-hikers are passing through Virginia. If you have a chance, it’s worth talking to some of these people about their experiences. Most of them use trail names instead of real names during the hike. The one we talked to this night was very friendly and talkative. He said that his toughest leg so far was in the Smoky Mountains, but this was largely due to the snow that was still there. He was enjoying his first sunset view in SNP. It’s quite an accomplishment to be able to hike the entire AT. I would love to be able to have the chance to do this some day. The rock cliff below is an impressive sight to find along the Frazier Discovery Trail. Difficulty – 1.5. Other than a mile of climbing along the fire road and the Appalachian Trail, the hike is either level or downhill. Trail Conditions – 4.5. The trail is extremely well-maintained. Views – 4. The view from the Loft Mountain summit is really spectacular. Waterfalls/streams – 0. No streams on this trail. There is a spring near the PATC maintenance cabin. Wildlife – 2. We saw deer and a rabbit. Ease to Navigate – 4. There are a couple turns, but the directions are well-marked on cement posts. Solitude – 3. 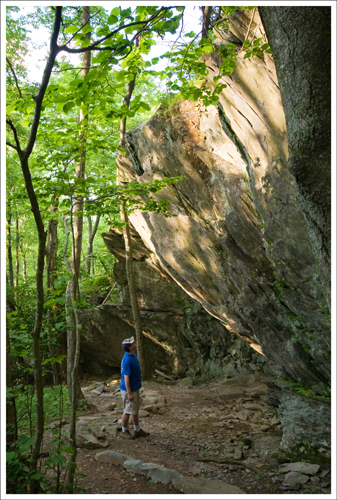 The hike is short and near one of Shenandoah’s campgrounds. So, on busy weekends, expect to see a fair number of people. We hiked it on a weeknight in June and came across a pair of backcountry campers and an AT thru-hiker.